We bought some bone in chicken breast at Wholefoods they were not on our list but on sale. I am not a big white meat fan but it is better for you and Lyn does not like the dark meat I love her and I cater to her like most of the time. Anyway we already used the boneless chicken breast in the Carrot Orange Juice Chicken Noodle Soup and I had planned on doing something with it last night. I was surfing the net on my lunch break and found a few but this one from DadCooksDinner.com caught my eye, I did not have everything he used but had substitutes, onion for shallot, dried instead of fresh herbs and I added lemon juice. I did not notice the title until today when I went back to post. He did call it lemon herb sauce after all, but listed no lemon I took liberties, besides it would not be the first time someone else other than me or my Mom left out one ingredient. Anyway this came out with crispy skin, moist and tender so good when Lyn walked in the door I said forget your special diet you just got to try this. She asked if I marinated in buttermilk it was so moist and tender. Like he said in his post he has pan seared oven roasted steak, pork etc. – a man after my own heart – he thought why not with chicken. You can adjust the salt and pepper to your taste, my wife is a pepper head so. Prepare the Chicken: Heat your oven to 350F. If the chicken breasts came with the rib section still attached, remove them- they might get too dried out. Rinse and pat dry chicken. Combine salt and pepper together and sprinkle the chicken all sides. Let rest at room temperature until the pan is heated. 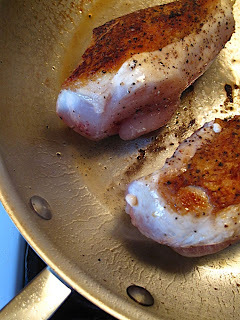 Sear the chicken: Put the teaspoon of oil in your fry pan, and heat over medium heat until the oil is shimmering. Swirl the oil around to coat the pan, then add the chicken, skin side down. Sear for 4 to 8 minutes, or until the skin is a dark golden brown. Flip the chicken and sear the bone side for 4 minutes. *Searing time will depend on how crowded your pan is. If your pan isn’t very crowded searing will take less time – 4 to 6 minutes. Roast the Chicken: Move the pan to the oven and roast until the chicken is cooked through, 15 to 20 minutes. You want to cook the chicken until it is just 160*F in the thickest part of the meat. (The best way to check this is with a remote probe thermometer.) Remove the pan from the oven, and move the chicken to a serving plate. Keep the oven mitt on the handle this reminds you the handle and pan are still very hot. I have the scars to prove that I had brain fart moments. Make the Sauce: Remember, the handle is still &*&^%!! Hot. Using an oven mitt or pot holder, put the pan over medium heat. Add the onions to the pan and sauté, stirring, for about 1 minute, until the onion is softened. Add the chicken stock and herbs, turn the heat to high. Scrape the bottom of the pan with a wooden spoon to loosen all the browned bits of chicken, bring to boil until the stock until reduced by half, about 5 minutes. The plate holding the chicken breasts will have some chicken juice on the bottom; add it to the pan. Turn off the heat, and remove the herb sprigs if you used fresh. Whisk the butter into the sauce, and add salt and pepper to taste. I am on a self imposed very low salt diet so I used the salt sparingly. 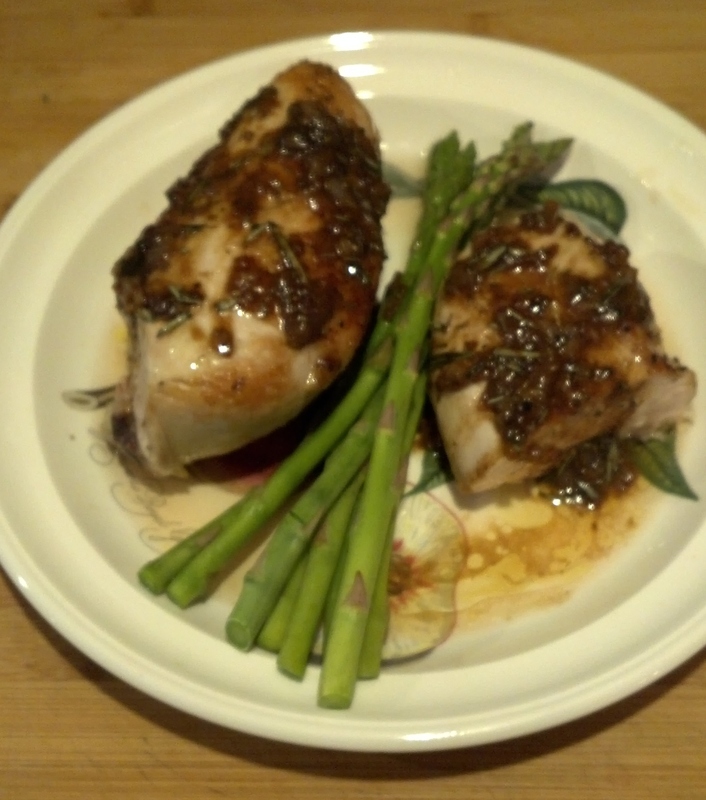 Spoon a teaspoon of sauce over each breast, then serve I also used over the asparagus. This entry was posted in Bird, Chicken, Sauces and Gravy and tagged Black pepper, Butter, chicken, Cook, Deglazing (cooking), Home, Kosher salt, Stock (food). Bookmark the permalink. Wonderful! I am so glad I found this site. Thanks for sharing your recipes. Thanks I enjoy cooking and sharing, been a little quiet this winter.